What’s keeping Stephen Boylan up at night this month? One of the unexpected joys of the movies so far this year has been Love, Simon, Greg Berlanti’s touching and heartfelt adaptation of Becky Albertalli’s bestselling YA novel, Simon Vs The Homo Sapiens Agenda. The first mainstream teen rom-com with an LGBT character at its core, the film took huge pleasure in wholeheartedly engaging with the standard tropes of the romantic comedy genre, rather than expending much of its energy or charm in trying to subvert them. 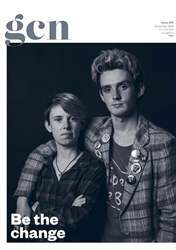 In this special edition, our community's younger members take over for the annual Youth Issue. Our guest editor Emily profiles a group of young activists leading the charge for a new Ireland. We celebrate 15 years of the awesome BeLonG To, the national organisation supporting LGBTI+ youth while one of their subgroups, The LadyBirds, tackle the lack of awareness around women's sexuality and sexual health. A young asylum seeker in Direct Provision tells us of his struggles with homophobia while LGBT+ people in rural areas speak about the effects of isolation and how youth groups helped them find confidence. We top things off with a preview of the upcoming Science Of The Kiss exhibition, part of GCN's takeover of the Science Gallery. This is a good one!